Today it was supposed to be simple, light and pleasant, and here it was – affirmations that came out to describe. For some time, the subject has been circulating in the air for some time now, and apparently the time has come to ground it and present it. I have been playing with affirmations for some time, but in an effective and correct way only for some time. Be warned here: neglected affirmations do more harm than good in the sense that people stop believing in the effectiveness of this technique and cut off access to one of the very effective ways of improving the quality of life. 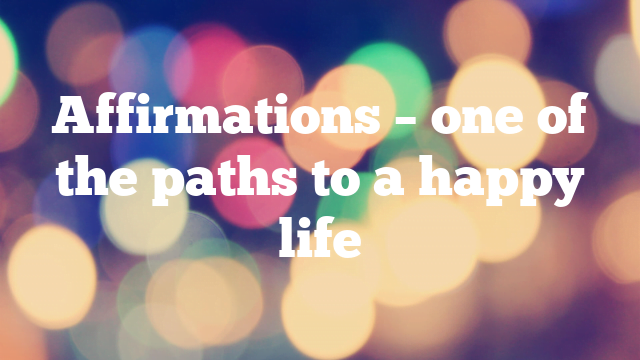 2 How does affirmation work? 4 How to make an affirmation? Affirmation translates directly from Latin (affirmatio) is consent, approval, recognition, handy, confirmation. Developing this definition a bit more: it is taking a position. It is the clothes of your dreams and desires in words, so that from the mental level they have a chance to manifest themselves in the material. Words can change the world and people. Words can create and shape reality. Prayers, mantras and spells have this task. Magic thrives thanks to phrases. Do you remember this unfortunate poem by Szymborska, who everyone did at this or that stage of education? The one about the roe deer (“Joy of writing”)? It is worth reading it again, forgetting all the “information” taken from the lesson. It is also good to believe with all your strength and accept one sentence from the Bible. A sentence from which everything began (at least with Jan). For people with a more rational attitude, where the “magical” translations do not get convinced;). Affirmation is a technique derived from the RET theory (rational and emotive theory) and is based on the conviction that all patterns of our behavior are preserved not only through rhetorical repetition and translation of behavioral data of their effects and causes, but also emotions that are triggered during these processes . Affirmation, thanks to the combination of positive thoughts and emotions, allows to dissolve old patterns and introduce new ones that are more conducive to our development. There is also a recently introduced theory in Poland of subliminal affirmations (attention is a health risk for people with epilepsy) which bypasses the still present in the classical approach issues of consciousness and faith, and even the emotional basis. The subliminal affirmations are served subliminal on the frequency of sound heard by the human ear and yet received without the participation of consciousness, thanks to which new patterns are introduced directly into the subconscious which is responsible for our instinctive behavior in specific situations. The news carries that they are effective, however, before applying them, you must firstly reassure the classically full trust in the record producer. Set your position. Affirmation is a measure of your faith, determination and will to change. In everyday life in our community, we usually appear in the roles of conciliators and negotiators as well as dependent persons: we finish the fairs, reach consensus, make compromises, we ask. In affirmation, there is no place for it, in affirmation you become the ruler of your life: you do not negotiate with anyone, you do not offer to exchange something for something, you do not ask for it. You set your position. You state how it is. At the moment of affirmation creation and then at work with it, this position and this statement become an absolute truth. You only count: your life, your opinion, your needs. At least for the time of affirmation creation and for those moments when you will work with her / work only think about yourself and what is best for you. How to make an affirmation? I repeat the warning: a badly designed affirmation will do more harm than good, so before you start affirming something, think about it five times, or if you are sure to abide by the gold rules listed below due to my learning on my own mistakes – there is no point in repeating them on your own ;). If you are not sure if everything is playing, please leave an affirmation in the comment underneath, take a look and suggest a correction. Affirmation should be constructed only in statements that state. In other words: no negatives. If the word “no” appears in your affirmation, your mind will simply ignore it and there is a good chance that it will lead to an increased dose of what you were going to eliminate in your life. Eliminate phrases such as “I want,” “I want,” “I need,” “I dream about …” from my affirmations. If you affirm, let’s say, “I want to go to Greece this year,” the world will take it simply as information that you want something … Probably the only thing that will change is that you will want more and more, and not that the world will help you realize your desire. It is most effective to use present tense. The future time (especially the imperfective mode) causes the implementation to be postponed for an indefinite period. There is a kind of trend for the use of phrases such as “I deserve”. Personally, I hate them. I spent most of my life “deserving” before I discovered that this “deserving” has nothing to do with what I actually get and that the only thing I can gain from it is a lot of illusions, overloading and susceptibility to various manipulations. Remember also that Rome was not built at once: it is much more efficient to affirm more than a dozen simple statements in turn than to put a sentence-tape of fifty words. Do not mix other people’s affirmations. Affirmations is your private affair that will change your life and the perception of a world that will adapt in its own way to respond to your expectations. You control affirmation, but you have no influence on the way it is implemented (because of the accuracy you can gain it by introducing appropriate modifications, but it rarely comes to good health). People know best what they want, but the world knows how to achieve these desires so as not to disturb the balance and maintain harmony. I open myself to the idea that the world is beautiful and full of good. I open myself to the thought that happiness exists and is achievable for me. I am opening to the thought that I can change my perception of the world. I open myself to the thought that I can change my life. I open myself to the idea that people and the world are kind to me. I open myself to the idea that all changes lead to a better life and a deeper understanding of it. Discover what (what thought, feeling or belief) interferes with achieving affirmative success and transform it into a pattern conducive to change for the better. Once you’ve created an affirmation, it’s time to get to the right job, it means no more than just repeating. It can be affirmed mantrically during meditation, saving affirmations every day several times on a piece of paper (optimally one time with the other hand so that both cerebral hemispheres participate in the process), singing, humming or murmuring, painting and placing in a visible location so that involuntarily once read it once, record it on the recorder and play it on headphones or speakers (even when sleeping). The more often, intensively and longer you work with each affirmation, the more spectacular its effects will be. The minimum is 10 minutes affirmation by any method in the morning immediately after waking up and 10 minutes before going to sleep for a month. At the beginning, work with a single affirmation and see which technique is the most suitable for you – that is, which gives you the most pleasure (positive emotions are very important when affirming). With meditative mantra, you can, for example, count down repetitions on decorative beads or by transferring small pebbles from the bowl to the bowl. When you write affirmation you can have fun by trying different writing styles, pen colors, or changing the hand holding the pen. During singing, humming or purring you can play with your voice and melody. Painting and then admiring your own work is fun in itself, especially if you take your work off the wall from time to time and replace it somehow. When you record an affirmation on the recorder you can have fun imitating the voices of famous actors or singers, or somehow interestingly accentuating the words. It is important that the affirmation evokes positive associations and emotions: smile, hope, faith, serenity – not to “pierce it” but take it with real pleasure every day. Important: we do not take breaks. If you are a person who does not particularly care for the systematic performance of repetitive activities, start by saying that you are opening yourself to the pleasure of gradually and repeatedly improving the quality of your life;). If you affirm, let’s say “the joy of life” and in the middle of the day you will get negative thoughts that the world is bad and you can affirm an affair by drawing a pretty flower, or playing your favorite song. Good luck, and happy Sunday again. Ordinary life problems and esoteric law of attraction. Does that make sense? Why do you not succeed?